Big Finish: Doctor Who - COLD FUSION Review | Warped Factor - Words in the Key of Geek. Matthew Kresal finds that the recent Doctor Who novel adaptation from Big Finish leaves him anything but cold. There are few things that Doctor Who fans (and probably fans in general) enjoy more than a mystery. For more than a year after Big Finish first announced their series of audio drama adaptations of a number of Wilderness Era novels, the last release remained exactly that. A mystery. That is largely because this story features not one Doctor but two. 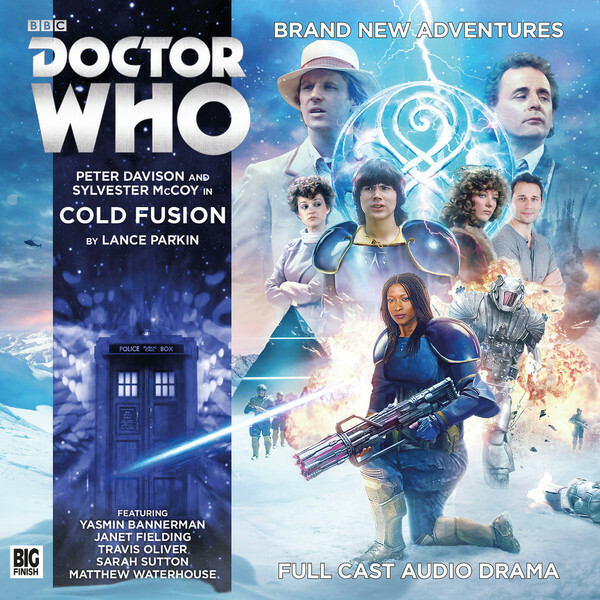 Cold Fusion was famously the only multi-Doctor story that Virgin released. That being said it does tend to favor Peter Davison's Fifth Doctor over Sylvester McCoy's Seventh, but that isn't a bad thing at all. What it does is really highlight the differences between these two Doctors and their companions, how their approaches are different and how Terrence Dicks' claim that “the Doctor is always the Doctor” isn't quite the case. The Fifth Doctor, fresh out of his regeneration and with a TARDIS full of young companions running around, is getting directly involved in the action and is quite empathetic to the plight of the people around him. Meanwhile the Seventh Doctor is off being very much himself: behind the scenes pulling strings and orchestrating events. Never once in listening to the story do you wish that the Doctor's would swap places because they are precisely where they need to be. Davison and McCoy both play their roles to the hilt as well, with Davison in particular getting a chance to shine, especially in his sequences with Patience. If nothing else, Cold Fusion is worth a listen for a chance to hear these two Doctors at some of their finest moments. Indeed that can be said for the companions as well. If you've often felt that the 1982 TARDIS crew was let down on screen by writers having no idea what to do with everyone than Parkin presents the cure for that. Every single one of the Fifth Doctor's companions from Nyssa and Teagan right down to Adric gets something to do across the length and breadth of the tale. In fact, it might very well be the best work Matthew Waterhouse has done as Adric, beyond his stretch with Tom Baker's Fourth Doctor, with some nice moments alongside both Doctors. The Seventh Doctor's companions, the novel characters of Chris and Roz, are both well served here too, with Chris getting plenty of fine comedic moments (and some wonderful chemistry with Sarah Sutton's Nyssa) while Roz gets a fair share of action heroine moments. All six companions are put to good use with no one feeling out of place or like a spare part. Let's not forget the supporting cast as well. Of particular note will be actress Christine Kavanagh as the mysterious Patience, a woman whom it seems has a bit of a hidden history involving the Doctor and the Time Lords. Kavanagh plays the role with a considerable amount of warmth and sympathy as we go along with her and the Doctor in trying to piece together who she is and what her role in events is, was, and will be. For those with an eye on continuity, the character and Kavanagh's performance will be of special interest. The supporting cast also includes Jeremy Hitchen, Peter Caulfield, and Sharon Maughan in a number of roles both large and small, though you'd never know it listening to this with its feeling of “a cast of thousands” as one of the voice actors puts it on the brief extras track that concludes the release. Along with the ever strong Big Finish production values, it is them who back a strong main cast and help bring the story to life. It is to Parkin though, both as the originator of the source material and as adapter, that the lion share of credit for Cold Fusion's success goes to. Those of us who are fans of what is today termed Classic Who (and let's be honest, if you're considering purchasing this release you probably fall into that category) likely think that six-part adventures could often be overlong and lack enough story to cover between two and three hours of running time. Indeed this novel adaptation is the longest Big Finish's release by a full disc worth of story. Parkin's tale though is up to the challenge with a story that takes in two Doctors, six companions, a conspiracy on an Earth colony world, beings from alternate time-line, and a whole series of continuity references (including some that will make long time readers of the Wilderness Era novels perhaps literally punch the air with delight). Parkin gathers this all into one quite sizable and often surprisingly funny package. Yet it never drags as the plot and a series of action set pieces keep the story moving while one twist after another leaves the listener begging more. Even better, for all of the continuity that Parkin brings up (and all the implications that might very well go along with them), Cold Fusion never once ends up so far down its own past as to be of interest only to die-hard fans. While I can not speak for its faithfulness to the original novel, I can certainly say that this audio drama is a riveting piece of work and one for which Parkin deserves a good deal of credit. If this should prove (as it looks as I write these words in the middle of January 2017) to be the last of Big Finish's novel adaptations, then they have gone out on a high. From performances to production values, Cold Fusion highlights what Big Finish can do both in front of and behind the microphone to bring Doctor Who to life on audio. Yet it is Parkin's novel and script that showcase the best that these new adaptations have to offer: a chance for a new generation to encounter these tales “too broad and too deep for television” for the first time. Cold Fusion certainly proves itself up to that task and makes for grand Doctor Who storytelling along the way.